The Phoenix 2 portable Bluetooth speaker by Beacon Audio is a coffee cup-sized speaker that delivers big sound, handy two-way phone conversation capability, and long battery life all at a moderate price point. It would make a great gift or a cool conversation starter at any party. No one will believe the volume and depth of sound that you can squeeze out of this tiny box. The two speakers and single subwoofer might be a clue to that volume, although I’m not officially an audiophile. The range is somewhere between 30 to 80 feet depending on where your music device and the Phoenix 2 are located. Walls, metal objects, and other electronic devices might interfere at varying levels. But outside in good weather with no obstructions, expect to be able to walk pretty far from the speaker or from your phone with no problems. As you can see from the video, the Phoenix 2 is small, attractive, and ready to serve. I like it. I can’t find any flaws with it. That said, I do think that the price is a little high. $60 seems a little steep, but I’m kind of cheap, hence the frugal part of this blog. I think that a $30 to $40 range would be much better. 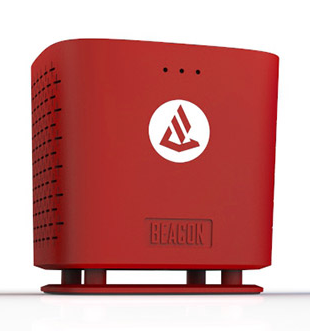 Why it’s Frugal: The Beacon Audio Phoenix 2 portable Bluetooth speaker isn’t particularly frugal. It does deliver an unexpected sound quality, even at the highest volume level, it is a luxury item, especially at the $60 price level. If you’re looking for a portable Bluetooth speaker that will pair with just about anything you have and doesn’t require an extra app or any hassle, then the Phoenix 2 is a great choice. It comes in a variety of colors and free shipping from Amazon or the manufacturer, so that’s a big bonus. Recommendation: Buy it. Have fun with it.